Who wants to be a starving artist anyway? In this autobiographical account of his background as a painter, the author’s unique outlook on life is echoed as much in his writing as it is in his style of painting. Realistic and forthright, he challenges people’s opinions in Who wants to be a starving artist anyway? on what constitutes art and what it means to be an artist. Bolsmann’s love of detail is evident in his paintings and Who wants to be a starving artist anyway is a treasure trove of interesting facts and anecdotes. Bold at times, like the colours of his paintings, he deals in Who wants to be a starving artist anyway? with aesthetics, beauty and kitsch; the artist as marketer and saleman, and exhibitions as trade shows, as he puts it. Bolsmann touches on topics such as what art is not, and he also deals with selection committees, art critics and a host of other subjects not taught at art schools. 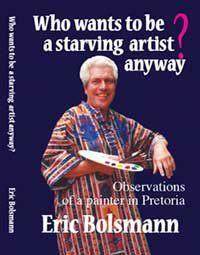 Bolsmann says that he has written Who wants to be a starving artist anyway? primarily to inform and to entertain. This objective he has achieved. The information concerning the various aspects of the fine arts he provides is valuable for anyone interested in the arts. His fresh approach to art he has presented in a readable manner. While Bolsmann hopes that the scenarios he relates put a smile on the face of the reader rather than cause controversy, he is aware that individuals may be in disagreement with some of the thoughts he expresses. This is bound to cause a stir among the art establishment, but Bolsmann feels that this should be seen in a positive light for a world of art without alteraction would be a boring world indeed. Who wants to be a starving artist anyway? is published with a soft cover by Be My Guest Publishers in Pretoria and appears in a 140 x170 cm format. The 170 page book is illustrated with black and white photographs. Imaginemag readers may order the book from the publishers at a special price of R150,00 inclusive Vat and postage. For details write to eric@ericbolsmann.co.za or telephone 083 454 1797 or 012 362 6698.